Every once in a while, there’s a reminder of just how amazing Twitter can be. 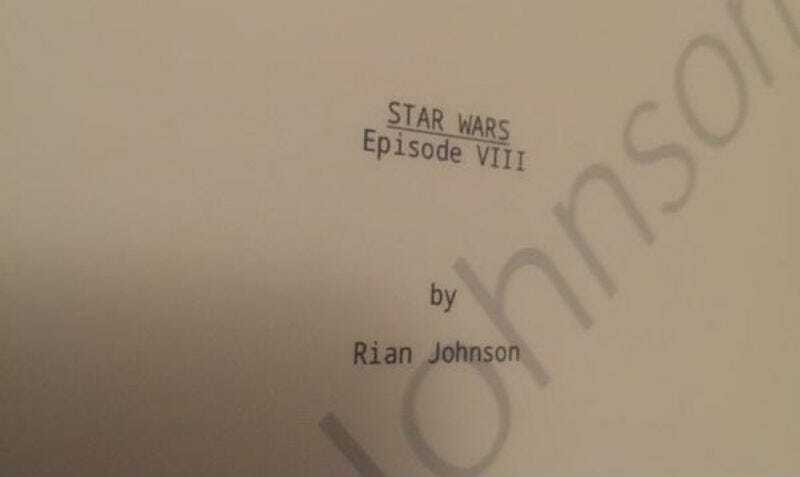 One moment, I’m running a harmless contest, and the next, Rian Johnson tweets me a photo of the cover page to the script for Star Wars Episode VIII. How did we get to that point? We’ll here’s the quick story. And that spawned some really awesome entries. I mean a guy named his kid Ezra, the main character on Star Wars Rebels. Another has the Millennium Falcon for a toilet seat and a lightsaber plunger. That’s just awesome. But, of course, the contest also spawned some funny responses, mostly friends trolling me. That’s a photo from my Instagram, photoshopped into a frame. Then, film producer Keith Calder got into the mix with some really funny tweets. Finally Calder actually posted something legitimately awesome and Star Wars related. And honestly, it would be hard to beat a platinum record of the Weird Al album with The Saga Begins on it. But Rian Johnson, the writer and director of Star Wars Episode VIII then jumped in. That’s what you call a mic drop. The actual script to Episode VIII. That didn’t stop Calder, though. And honestly, that made me laugh so hard I cried. Too funny. Things went on for there, but in the end, I gave the code to the guy who named his kid Ezra. I think that was the right decision. And no matter what, it just goes to show that sometimes Twitter can take things from your email, to the tippity top of the Star Wars universe.